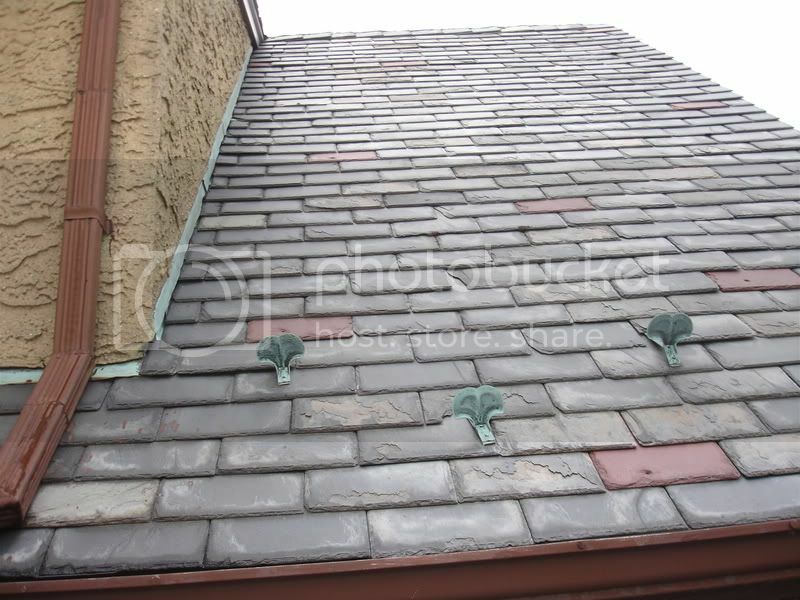 Slate Roof Central Message Board: New to slate roof - Identify what slate is this? i guess you can say i'm handy around the house. i don't do this stuff by trade...but i've done plumbing work, installed kitchens, etc. so i guess it's my second job fixing stuff around the house. another thing i do is working on cars. welding, body work, engine repairs, etc etc. thanks for the insight. don't worry...i know when i'm over my head so i'll call in a pro when the times come. Dan what dose this mean Occupation: fixin stuff, I was just wondering. As far as your roof, I think your roof has a good amount of time before needing a full replacement up to 20 years or more. Know I have only seen three picture so that is what its based on. As far as the gutter Yes it copper that was paint, and when the roof is replaced, you should replace those at that time. Both can have repairs done if need. It is starting to show some delaminateing but that dosn't mean the roof isn't working, it just migth not look that good. in a separate issue...the gutters are leaking. from the top the gutters appears to be copper (patina) but from the ground it looks like it was painted brown to match the house. so what to do? do i repair the gutters now and then wait until the roof is totally done before replacing that? i'm not a fan of water spraying everywhere during a rain storm. i do like the look of copper gutters and would like to replace it w/ the copper...is that over kill since the roof is going anyway? thanks for the help all. Sorry my post was miss-leading. I should clarify. This roof should not be torn off but it also shouldn't have any major surgery done to the flashing or gutters. Keep worker traffic to a minimum at this point. You should definitely have broken or missing slates repaired but I wouldn't go much beyond that. You can find PA black slates that have been salvaged and are weathered but not flaking or delaminated. They should match pretty close. The roof can last a lot longer. When you start shedding dozens of slates every winter it's time to replace, but I doubt you are to that point yet. for a minute there i was worried that i had to get a new roof. well if it's salvageable i'm fine with repairing the broken and damaged tiles slowly. any idea where i can get slate to make repairs? the house was built in the 30's so i assume it's been on the house for 70ish years. i do see some hack job repairs (tar over nails) so i'll be correcting them. 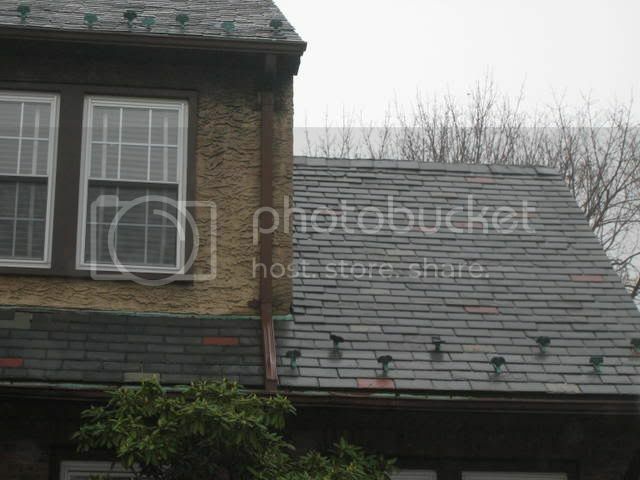 The Pa slate does show some signs of delaminating,few broken corners ect..but this roof is worth repairing,will turn water for a number of years..I still have some sections of Pa slate on my roof that 10 years ago were not in as good of condition as your slate are,and they are still turning water. The field is PA black and it is starting to delaminate which means you shouldn't spend a lot of money on restoration. The red slates are NY red which are some of the best slates ever. Do you know how old the roof is? here are some updated pics...let me know what you think about the condition. yes it was raining so it's wet in the picture. we still have some melting snow going on so once it clears up a little i'll take a closer shot that's dry. Is it wet? It may be really hard to identify from any photo if wet. A closer shot would be good (texture and color). Where is the house, Downstate NY? you need a shot closer or farther in the better picture? It looks to be a black slate maybe Monson, need a little better picture. There is a few Red and Green pcs of slate here and there. long time reader first time poster. been reading the slate roof bible to pick up more info on slate roof. 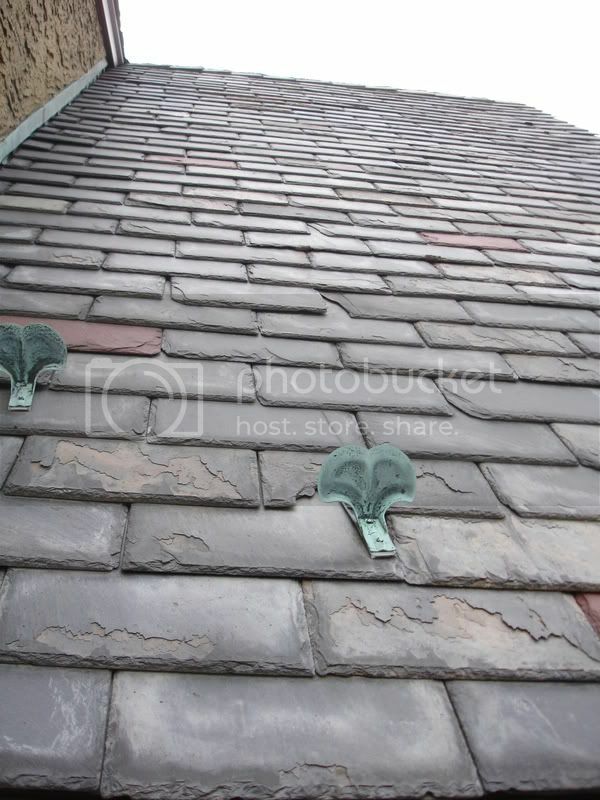 can anyone identify what kind of slate is on this roof? seems to be a mix of different colors.